Knowing about the health benefits of carrots helps you to want to add more of them to your daily diet. The benefits of carrots are both varied and numerous. After reading about all the goodness of carrots, you may want to make not only the carrot raisin salad but also find other ways to eat and enjoy raw carrots. It was the "secret weapon" of radar, not the health benefits of carrots, that helped the Royal Air Force "see" Nazi bombers at night during World War II. However this greatly exaggerated myth of the health benefits of carrots was also a way to encourage British people to eat foods that they could easily grow. Anti-Aging – Eating carrots will make you LOOK good. 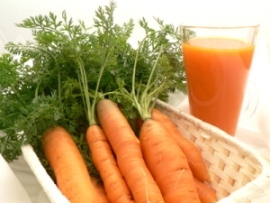 Yes not only will they help you to see better, more on that later, the antioxidant beta-carotene which carrots are rich in is a powerful antioxidant. Among other benefits, this antioxidant seems to be able to slow down the aging of the cells. The slower your cells age, the better you look and feel, in short, YOU age a lot slower than your non-carrot eating peers. Eye Health A combination of Vitamin A, which also functions as an antioxidant, and/or the beta carotene makes for healthy eyes. Heart Health - Along with the beta carotene, carrots also contain the plant chemicals alpha-carotene and lutein. These also with the heart healthy fiber (a mere ½ cup of carrots contains 2 grams of fiber) which helps to reduce cholesterol levels. Stroke Prevention – A study by an ivy league medical school found that those who eat 6 or more carrots weekly were far less at risk for strokes than those who eat only a single carrot per month or less. Want all of the benefits of carrots but don't care to eat bunches of them? Carrots are great juiced. Not only do they taste good, (peel them first if you wish to avoid the “earthy flavor”, otherwise keep the peelings on and enjoy even more nutrition from them) carrot juice seems to have wonderful properties to enhance health. Adding the juice of an apple will make for an even more delicious beverage. Juicing the carrot releases not only the good juice but also breaks it down so that your cells can absorb more of the carrot nutrients. In short, to improve or enhance your overall health, eat your carrots. Finished with Health Benefits of Carrots?